Random vibration is motion which is non-deterministic, meaning that future behavior cannot be precisely predicted, and it is a characteristic of the input or excitation. To specific a random vibration is usually is used the ASD (acceleration spectral density). The root mean square acceleration (Grms) is the square root of the area under the ASD curve in the frequency domain, and it express the overall energy of the random vibration. A PSD curve provides the power of a signal as a function of frequency. For random vibration analysis usually it uses the units of G2/ Hz, G denotes the g-force. For random vibration, the specification curve is actually an acceleration spectral density (ASD) but is also displayed in “power” terms or measurement units squared as a function of frequency. It’s just a convenient way to express the profile of a random vibration spectra. While the term power spectral density (PSD) is commonly used to specify a random vibration event, ASD is more appropriate when acceleration is being measured and used in structural analysis and testing. For the exemple shown above the Grms of the input PSD is 13. 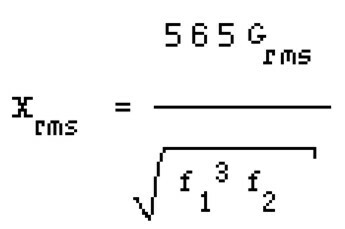 This can be calculated by taking the square root of the area under the acceleration spectral density curve. The RMS or Grms value of random vibration spectra is important since it provides a representation of the area under the curve and is a single value approach for performing a quick comparison of spectra. Although, two spectra can look very dissimilar but they can have similar a similar RMS (or GRMS) values. The majority of random processes fall in a special category termed stationary. This means that the parameters by which random vibration is characterized do not change significantly when analyzed statistically over a given period of time – the RMS amplitude is constant with time. For instance the vibration would be statistically similar for all missiles of the same design. It is possible to subdivide a process into a number of sub-processes, each of which could be considered to be stationary. This aspect helps the study of this phenomenon from technical point of view. Any vibration is described by the time history of motion, where the amplitude of the motion is expressed in terms of displacement, velocity or acceleration. Sinusoidal vibration is the simplest motion, and can be fully described by mathematical equations. Instead a random vibration is one whose absolute value is not predictable at any point in time. A major difference between sinusoidal vibration and random vibration lies in the fact that numerous frequencies may be excited at the same time. Thus structural resonances of different components can be excited simultaneously, the interaction of which could be vastly different from sinusoidal vibration, wherein each resonance would be excited separately. The instantaneous amplitude of a random vibration cannot be expressed mathematically as an exact function of time, it is possible to determine the probability of occurrence of a particular amplitude on a statistical basis. To analyse in the statistical sense the random process, an ensemble of possible time histories must be obtained, wherein the amplitude is measured over the frequency range of excitation. 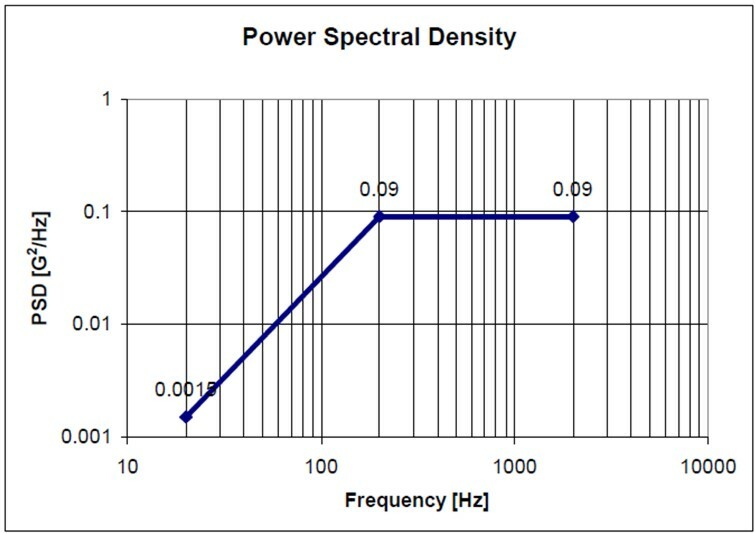 The characterization of random vibration typically results in a frequency spectrum of Power Spectral Density (PSD) or Acceleration Spectral Density (ASD), which designates the mean square value of some magnitude passed by a filter, divided by the bandwidth of the filter. The simplest random excitation to analyze is a band limited white spectrum shown below. The overall input Grms is the square root of the area under the curve, i.e. a) an infinite number of harmonic vibrations with unpredictable amplitude and phase relationships in the frequency domain. b) the sum of an infinite number of infinitesimal shocks occurring randomly in the time domain. In the first case, response at a particular frequency may be the primary concern. For example, when a displacement sensitive device is excited at its natural frequency, relatively large displacements may result in malfunction. In such a case, the malfunction might be corrected by reducing the amplitude of excitation at the particular frequency of concern – the natural frequency of the device. This might be accomplished by inserting a vibration isolator between the source of excitation and the device. Alternatively, displacement might be reduced by adjusting the stiffness of the device, or by increasing damping at the natural frequency of the device. If the random vibration is considered as an infinite number of infinitesimal shocks, the overall Grms may result in a fatigue related structural failure of a component due to the intermittent shocks associated with the random excitation. In this case, the problem might be corrected by reducing the overall Grms or by increasing the strength of the component. Equation 1 is plotted as Figure 3, which is the probability of occurrence of the ratio of the instantaneous value to the RMS value. In Equation 1, X and Xrms could have units of displacement, velocity or acceleration, or derivatives of these terms. The equation 1 could be used in equation 2 to predict the probability of occurrence of instantaneous values of acceleration for a random signal. For exemple, returning to the problem of the black box with a 0.25 inchs clearance to an adjacent structure, if Xrms were .0833 inches, the three sigma value would be .25 inches (3 x.0833), and the probability of impact would be .3% (the total area under the curve has value equal to 1.00 or 100%). The probability of impact could be reduced by reducing Xrms. For example, if Xrms were decreased to .0625, a four sigma deflection would be required to cause impact, and the probability of impact would be reduced to .001%. The last 2 equations could be used in conjunction with Equation 2 to determine the probability of occurrence of a particular input displacement. Insertion of vibration isolators modifies the frequency response to a random vibration input in a similar manner to a sinusoidal vibration input, because in sinusoidal vibration, there is a frequency region of amplification and a frequency region of attenuation. Even if the insertion of vibration isolators modifies the frequency response to a random vibration input in a similar manner to a sinusoidal vibration input, in random vibration, the amplitude of the response is modified by transmissibility squared, whereas, in sinusoidal vibration, the response is a linear function of transmissibility. This difference is due to the fact that in random vibration, we deal with power, whereas, in sinusoidal vibration, we deal with acceleration. For instance, if a black box has a 0.25 inch clearance (X), and if Xrms (also d rms) is .0833 inches, a three sigma deflection will cause metal-to-metal contact. If the isolation system natural frequency is 25 Hz, there would be an average of 33 impacts in a one minute period. If Xrms were reduced to .0625 inches, the average number of impacts in a one minute period would be reduced to one. Fatigue Analysis of the vibrations. Somethimes the b parameter has to consider the stress concentration K, for example if we are nearby a hole. Then it is necessary to calculate the number of fatigue cycles (n) accumulated for 1σ, 2σ and 3σ. To calcultate the remain life, can be used the Miner’s Rule that provides a reasonably good prediction. Following is an example of an MSC Nastran random vibration analysis run. The NASTRAN cards necessary to perform a random run are described here. The model is a Bracket monted on a crossbeam. This method is extremely similar to the frequency response runs. The preceding two cards are used for shaker point force recovery only (remove $ if needed). Cards used for plot output. NOTE: THIS IS THE ONLY WAY TO GET RANDOM OUTPUT! PARAM,RESVEC,YES is REQUIRED for accurate results when NOT using the seismic mass. It computes residual vectors. Shaker grid point. Often this is an RBE element attached to many GRID points with the independent GRID being the shaker point. ACCE refers to type of dynamic excitation, enforced acceleration in this case. Other options are LOAD for applied load, DISP for enforced displacement, and VELO for enforced velocity. The LOG LOG entries refer to how the data is interpolated on each axis. NOTE: All tables MUST end with an ENDT card. Also, tables are not always compatible between UAI/NASTRAN and MSC/NASTRAN. The tables used in the older version of this example would not work under Nastran 2001. 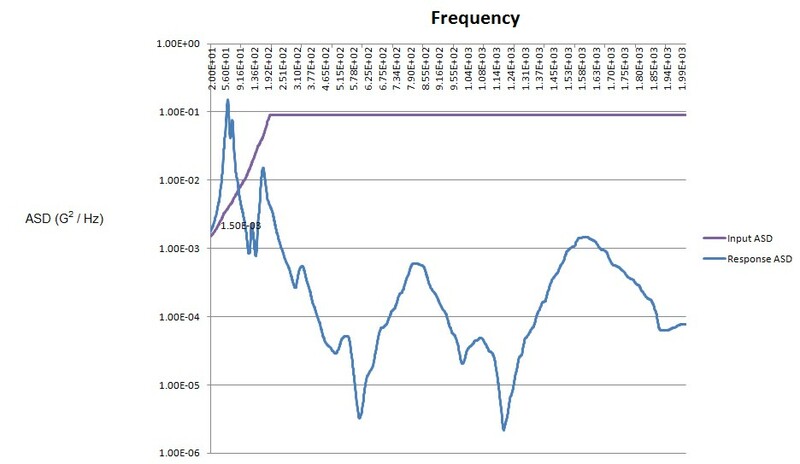 The damping is 1/Q over the range of frequencies; in this case Q is constant. Q can vary over frequency if the proper data is available. Column 2 is Frequency, Column 3 is PSD response. Below is a plot of the data given in the punch file (random_test.pch). It shows the input and the response. The input is shown in figure 1. The response in general shows the peaks corresponding to the modes of the bracket. This entry was posted in Stress Analysis and tagged 111, Gauss, NASTRAN, Random, SOL, Vibration. Bookmark the permalink. This is EXTREMELY helpful!! Thank you for posting it. Any chance you could post the bdf files? Thanks!